It’s not every day you get to work on an independent music video that goes #1 world wide, and I’ve had the good fortune of doing it twice thanks to Felicia Day and the awesome Guild team. Photo #1: We tried to make the sets look as lavish as possible, but as usual, the process started by looking around the BarnYard to see what was readily available. This always helps speed things up and keeps costs down. Luckily, I have a lot of handy things on my lot. You know, like elephants and stuff. I never really think about how ridiculous my world is until I actually write sentences like that! A great way to cheaply expand the scope of sets and still keep them rich looking is fabric. 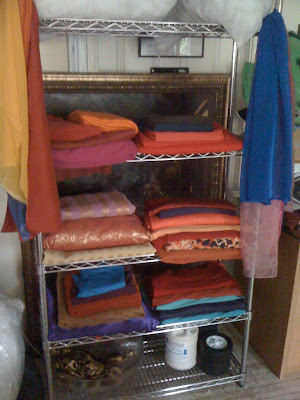 My art director, Alina Khanjian, collected bolts and bolts of bargain fabrics and discount cut-offs from the fashion district. We had a loose color palette, and made final decisions based on the majority yardage in the colors she found. Photo #2: We had a few weeks to put everything together, and Kim and Sean dropped by often to discuss concepts and get a sense of where everything was going visually. 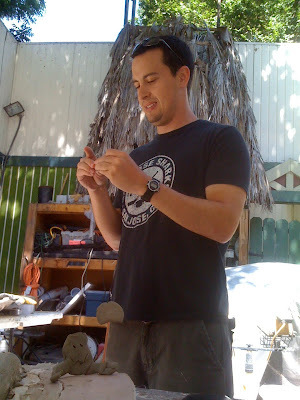 We usually talked while I was building, painting, or sculpting. This particular time, Sean jumped in on the fun and created a new character. Photo #3: Tombie the tombstone! 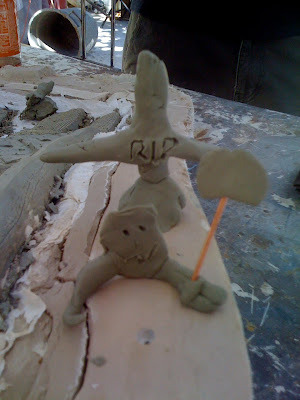 What shows that Sean is a true director is the fact that during the course of the 10 minutes he spent sculpting this piece, he created an entire back-story and vividly describe scenes with the character. Next time you see him, ask about the Tombie movie!!! Photo #4, 5, and 6: Felicia and Sandeep wrote the song, and although it has a Bollywood rhythm to it, the lyrics are about gaming. Felicia asked me to incorporate video game themes into the Bollywood visuals, too. So we decided to bring in some 8-bit elements, such as these statues of Ganesha, Shiva, and the monkey god, who looks very much like Donkey Kong!!! Photo #7: The 8-bit gods were used in the temple, each surrounded by the wheel of life. I originally intended for the wheels to be animated, but the art department was already way over tasked, and I was afraid it would slow production down during shooting, so I drop the idea. The wheels were hung up in the shop to keep them safe, guarded by the Lyke-Lyke from Legend of Neil! 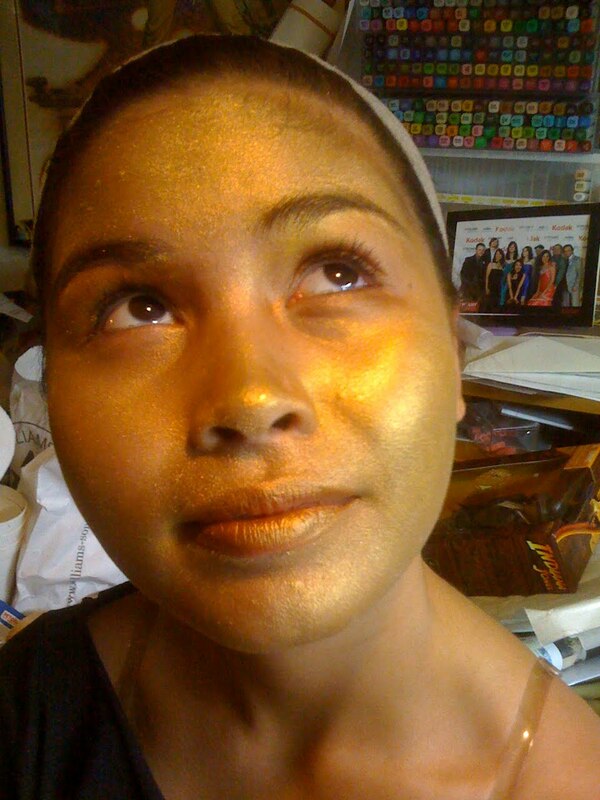 Photo #8: One of the elements I really wanted to do was turn Amy Okuda into a golden goddess. I needed to do some make-up tests, but Amy was busy, so Marissa Cuevas stepped in as my model. 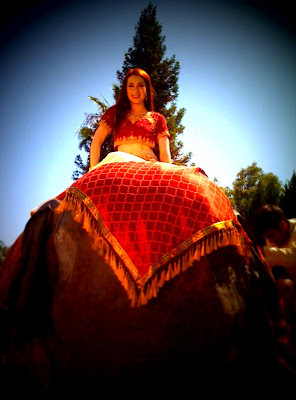 Photo #9: Here’s Amy fully golden! The entire make-up process took about 45 minutes. I used Kryolan bronze body paint, and highlighted it with gold Ben Nye Lumiere Luxe powder. I also used Ben Nye metallic crèmes to add a little color to her eyes, cheeks and lips. Photo #10: And if you are wondering what Marissa looks like when she’s not painted gold, you may have spotted her amongst the dancers in Game On. 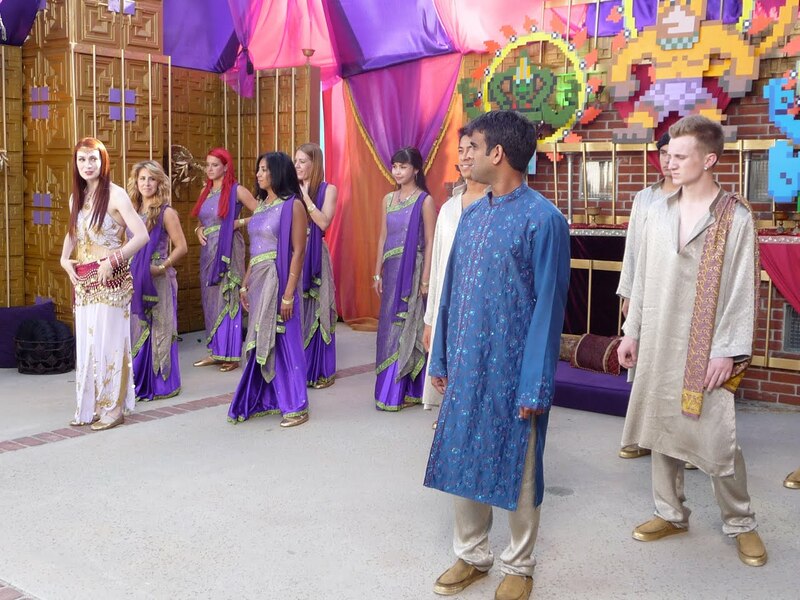 You definitely would have noticed her in the royal tent, where she presents Bladezz and Clara with the guilded X-Box. Photo #11: What you might not have guessed is that Marissa also bejeweled all of that herself! I like to call her the official bedazzeller of the Guild. Here we have the serving tray that she uses to present the game console. It’s actually made out of a clear punch bowl and a cheap plastic party tray, cabinet handle attached, sprayed silver, and bedazzled. We did this because we couldn’t find a real set that could house an X-box. 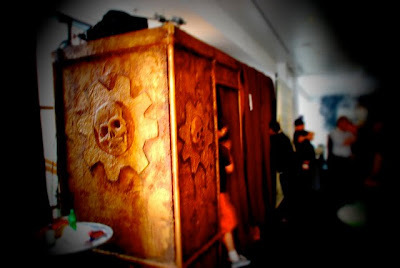 Photo #12: And this is the royal X-Box. And yes, it’s actually a fully functional console! We masked it off, sprayed it gold, and then Marissa went to town with the jewels. I made the controllers from plastic genie lamps from an Aladdin costume. I sculpted the buttons and put a ball and socket joint on the top to create a joystick. Sean and I decided to have them corded, even though X-Box 360s are wireless. The genie lamp turned controller just seemed to read better with a cable coming out of it! Photo #13: To complete that set, I made a pair of royal thrones. Believe it or not, these where actually dinning room chairs found on the side of the road a block from my studio. We used plywood to make the bases solid, Sintra plastic to create the 8-bit details, and reupholstered the existing cushions with red fabric. Of course, Marissa added the jewels, and we had dumpster royalty! 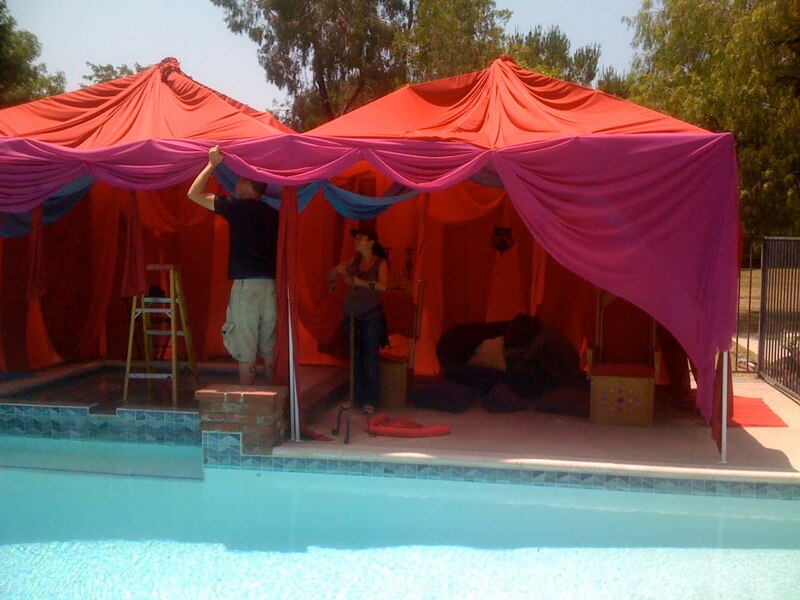 Photo #14: We assembled the sets the day before shooting, and built and painted all of the fine details on location. Once we had all the walls of the temple standing, I realized it needed more purple! You can never have enough purple! 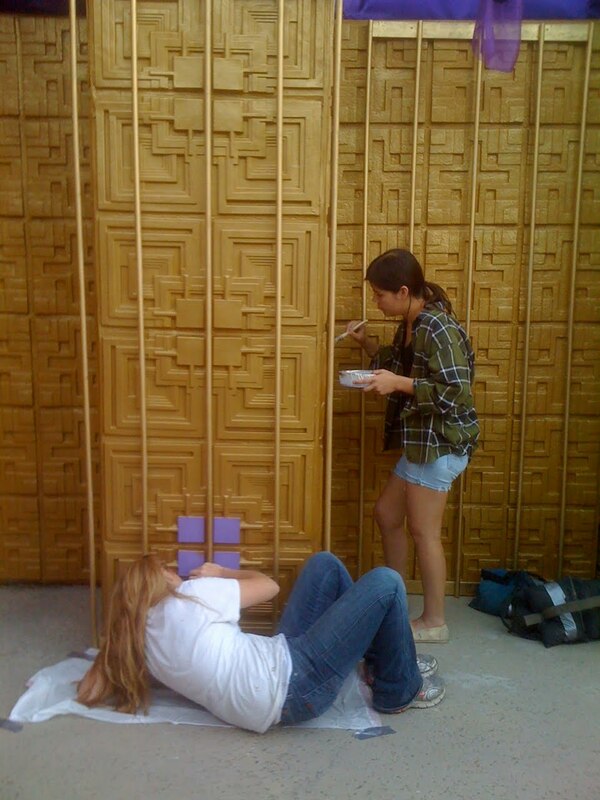 So Kat and Gabby spent the rest of the day painting purple squares into the pattern of the columns. Photo #16: …Where the royal tent was built. Alina really helmed this project. 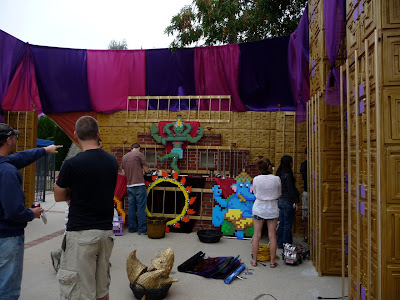 It is constructed from 2 10x10 pop-ups, draped in many yards of fabric and detailed with all these cool fringes she found. We covered the floor with pillows, and littered it with jewels and goblets. Photo #17: When I saw the pool during the first location scout, I instantly imaged the tent and a wide camera angle revealing 8-bit lotus floating in the water. Kim rearranged the schedule so we could shoot that scene at night and maximize the cool blue illuminated water contrasting against the warm reds of the tent. The lotus flowers floated perfectly all day, until we where ready to shoot! Then they started bunching up, or floating to the wrong end of the pool! Photo #18: Sometimes you lose track of time when you are crazy busy on the set. 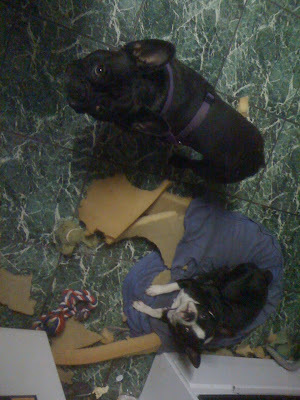 But luckily, I had the pups to remind me that I was gone 20 hours on the prep day. Nothing says, “Where were you!?!? !” like a demolished pet bed! He is made of latex with a fiberglass skeleton, and he breaks in half for transport. Or to create bizarre modern lawn art. 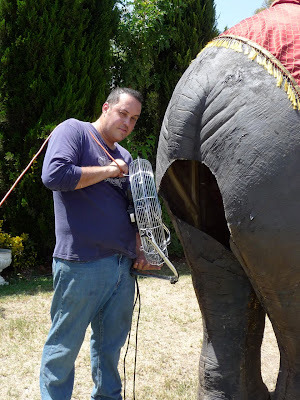 Photo #20: Once we got the elephant to the location, he needed to be put back together. Bryan Fulk climbed inside, and bolted the two halves together as a large group of us propped them up. The key phrase to remember is “as a large group of us propped them up”. 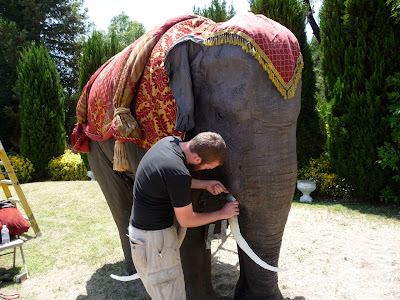 When we wrapped, Bryan decided to climb back into the elephant and unbolt him. Without the large group propping up the two halves. 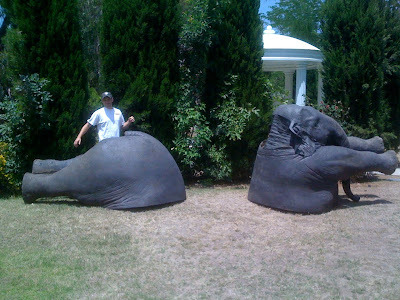 Needless to say, the elephant split in half as he released the last bolt, crashing to the ground and taking Bryan for a ride he will not soon forget. Not far away from this incident, @geekyfanboy was interviewing Kim Evey for the Knights of the Guild podcast(Microcast #19: Quest for Bollywood). If you listen closely at 00:58:02, you can hear the elephant impact and a moment later, Bryan yelling, “I’m alright!” Thankfully, he wasn’t hurt, and the moment caught on audiotape makes me laugh every time I hear it! Again and again...I'm gonna go listen to it right now! Photo 21: Speaking of things splitting apart, the first thing Kim and Sean locked down creatively was the video’s opening, where Zaboo would attempt to convince Codex to continue gaming through song. The scene would start in Codex’s room, as most Guild episodes do, but on Zaboo’s command, the walls would fly away to reveal the magic of Bollywood. Photo #22: I designed the walls to break apart into sections that a single person could carry, so it would be easy to choreograph the break away. The back walls had wheels so they could roll smoothly off to the side. Nick Carmichael helmed the construction, and it all went quite easily. Photo #23: The difficult part in recreating Codex’s room is that the real set isn’t a set at all, but producer Kim’s bedroom! And practically everything you see in the room during the show is really Kim’s. Paintings her friends did for her, furniture from her family. Her curtains, her pillows. Books. CDs. Treasured heirlooms. It’s hard enough to let a film crew invade your space, but to let them take your belongings out to a field!?! Kim is 100% dedicated to the Guild, so she trusted me to take everything we needed. I tried to pare it down as much as possible while still giving the illusion that everything was still there. In the end, we only broke one lamp! I’m sorry, Kim! I’m working on fixing it, I swear! 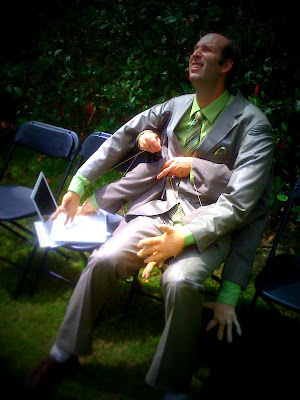 Photo 24: Michelle Dunn, the costumer, made Vork’s 6-armed suit, but I had to show it in my blog. It was truly the funniest thing I saw on set, and as usual, Jeff Lewis was hamming it up! Photo #25: Although he wasn’t the only one! Photo #26: Our friends that own the property where we shot have a pair of pigs, and they followed us around all day. 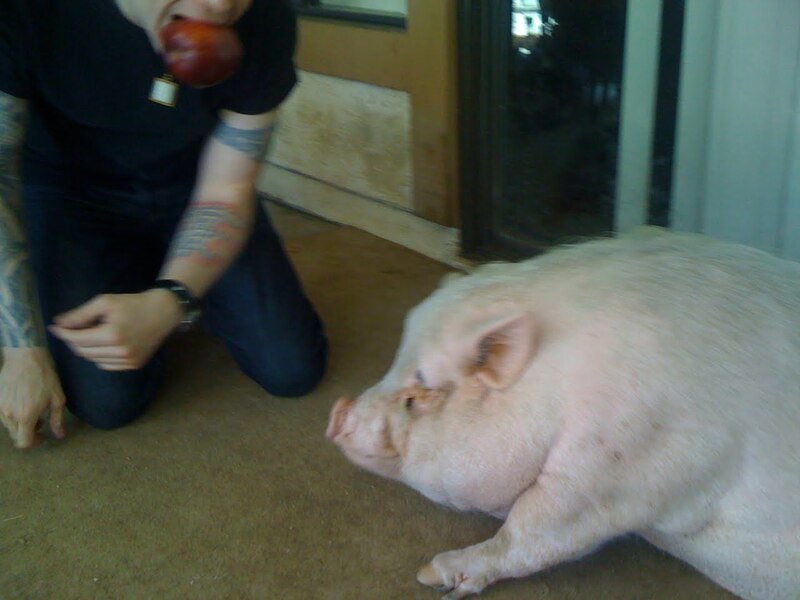 I tried to get a shot of Game On music producer Jason Miller with an apple in his mouth lying next to the pig, but I guess it smelled a treat and jumped up. Jason jumped up even faster! 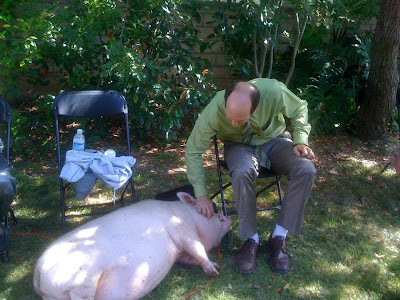 When 300 lbs of pig moves that fast, cute is no longer a factor. 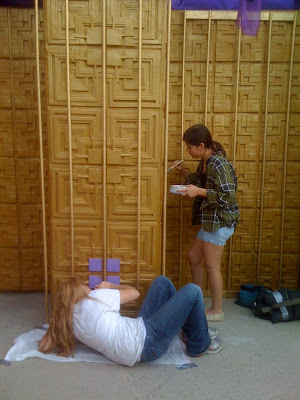 Photo 27: After the break away walls, we shot inside the completed temple. Once each set was ready, and shooting was underway, the art department would move on to the next set so it could be fully dressed when the production was ready to move. Photo 28: As the rest of the crew worked on the elaborate dance sequences in the temple, we finished prepping the elephant. Marissa made a saddle and headdress out of an old comforter set, and Bryan constructed and installed new tusks. 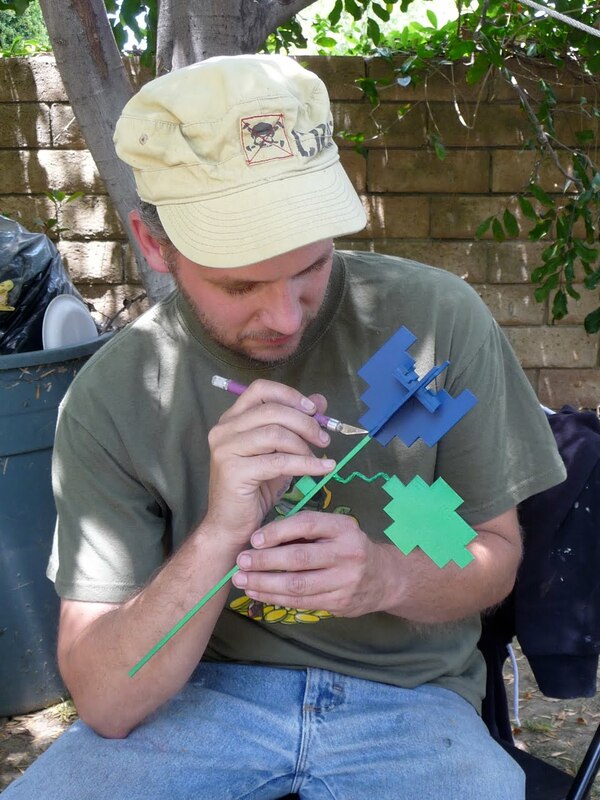 Photo 29: The night before we shot the elephant scene, Sean came up with the idea of Zaboo giving Codex a blue 8-bit rose. I was able to put one together on set right before we shot. Luckily it wasn’t a dozen! 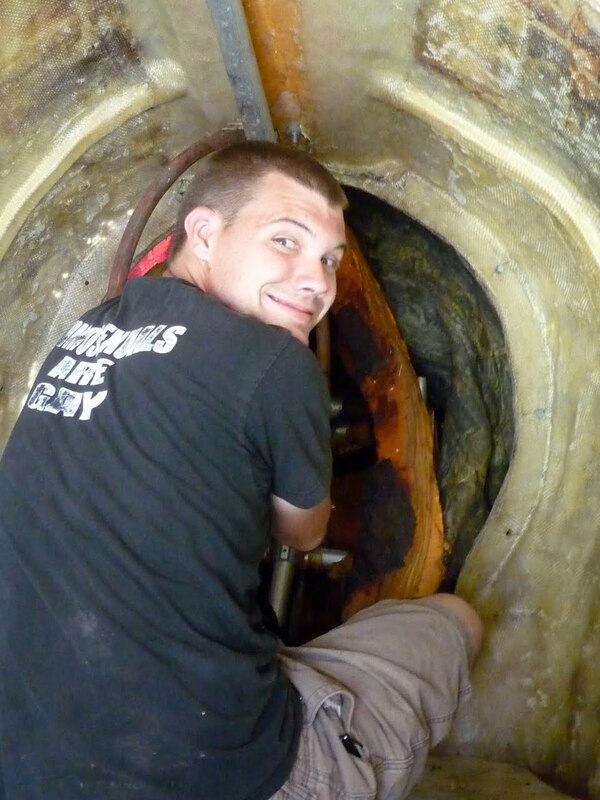 Photo #30: To help bring life to the elephant, Nick climbed inside and puppeteered it’s head with his feet. It wouldn’t have been that hard of a job, except that it was nearly 100 degrees outside, and probably 10 degrees hotter inside the elephant! Photo #32: Marissa assisted the elephant even more by flicking its ear with some fishing line. 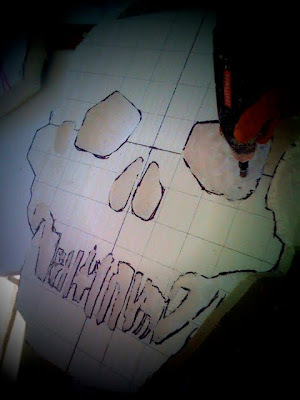 Photo #34: I can’t believe we were able to do that much work in so little time. But it was so much fun, and it’s always amazing to work with the Guild. Thank you so much to my awesome art department crew. You guys worked so incredibly hard. Take a break! You deserve it! 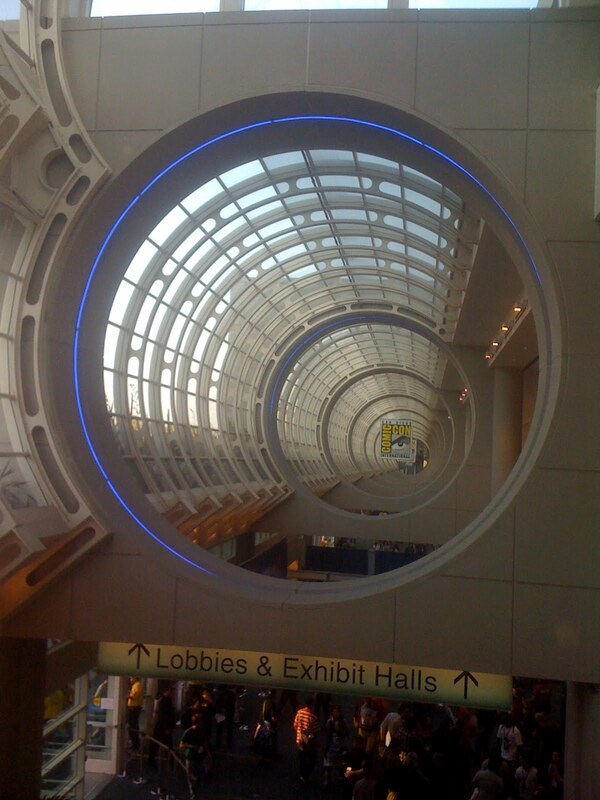 Well, it’s been a month since San Diego Comicon, and I have to say that a day hasn’t gone by without the events that took place being on my mind. So many good things came out of the show, I just wanted to finish talking about my experience down there before moving onto other topics! Comicon highlight #4: Seeing Drew Struzan finally get recognized as a pivotal icon in the entertainment art community! 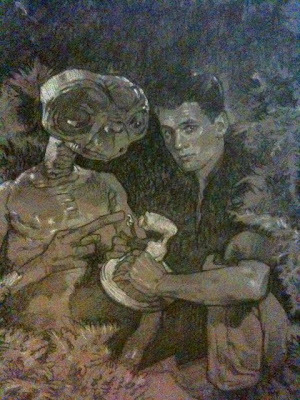 I know I have mentioned this in numerous blogs, but Drew has been my life-long all time favorite artist. He announced his retirement last year, after a once too often struggle with the studios wielding Photoshop as a weapon against traditional art, and people seem to have finally stopped taking for granted the amazing images he has given us for decades. Comicon International presented Drew with the 2010 Inkpot award for outstanding achievement in illustration. If you aren’t familiar with Drew, and wonder why he received such a prestigious award, close your eyes and imagine your favorite movie poster. Chances are, Drew painted it! Whether it’s The Goonies , E.T. , Indiana Jones , Star Wars , The Muppet Movies , or Police Academy , from the 70s through present day, Drew has been the brush that brought the movies to life. There are several books on his work you can check out, including my favorite, Oeuvre . Drew has been a dear friend and the single strongest inspiration in my life, and it was an honor to be at the panel to see both the award, and the sneak peek of the amazing documentary on his career. Comicon fail #4: So this isn’t the fail of any of the people involved, and I don’t have enough of the facts to accuse Comicon of wrong doing, but I do know that for most of the year, The Guild was planning an elaborate con presence due to the fact that they had secured more booth space than in previous years. We were all very excited, and I was involved in numerous conversations about possible prop and product displays, and creating a more fan interactive show experience. All of that was tossed out a few short weeks before the con when SDCC told The Guild that they needed to reduce their space due to over extended demand on the priority listings or some such thing. Luckily, Kim and Felicia are friends with the awesome Jamie Chambers (@jamie1km) who secured a corner booth at the front of Hall F and was gracious enough to allow us to raid it. On load in day, somehow they worked out how to display everyone’s merchandise in the cramped quarters, and Jamie & crew were very patient during the 4 hours+ of signings each day where as many as 9 of us crammed into the 10x10 booth to sign on an 8 foot table. 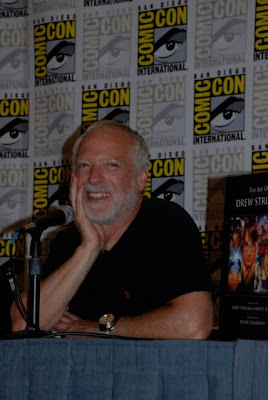 Comicon highlight #5: Of course, all of that was forgotten because the fans made everything so worthwhile! None of them seemed to mind waiting in line for hours to met Felicia and the cast. People were excited to be able to get CheeseyBeard’s t-shirts, The Guild DVDS , and @JeffCarlisle prints! 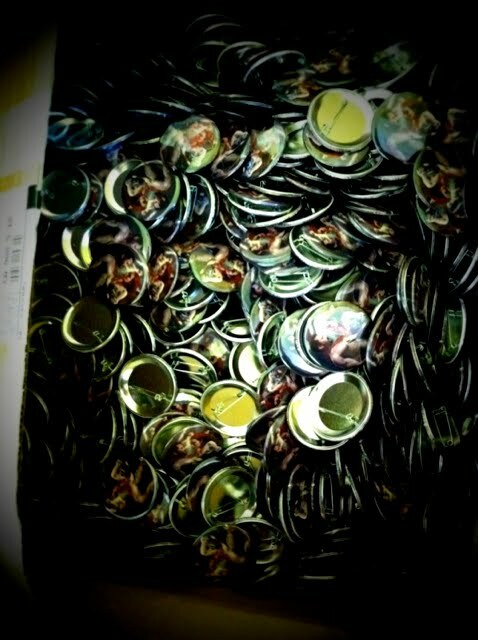 Over the course of the weekend, Felicia must have signed more than a thousand autographs! The turnout for The Guild was unbelievable, and I was, and am, so very proud to have been a part of that this year. People asked me questions all week about the season and the music video, Game On, which I will blog about next, and everyone was so excited about what was coming up. At the end of the day, no form of entertainment can survive without the fans, and it was awesome to meet so many of them. The booth was a great place to interact with everyone involved in the Guild and Legend of Neil, cast, crew, and fan alike. Here’s me mid conversation with Jeff Lewis and Sean Becker, two of the most brilliant minds you could ever come across. I also had the pleasure of talking shop with costumer @LisaPieces, Babylon 5 with Fandomania.com co-host Celeste Monsour (@celestemm), plotting and scheming with cosplay queen @GinnyMcQueen, and geeking out over Tron toys with the infamous Kenny Mittleider (@geekyfanboy). 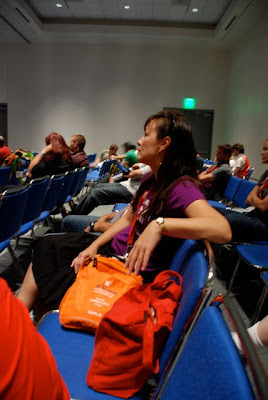 Comicon fail #5: There were sooooooo many people I wanted to spend some time with during the con. 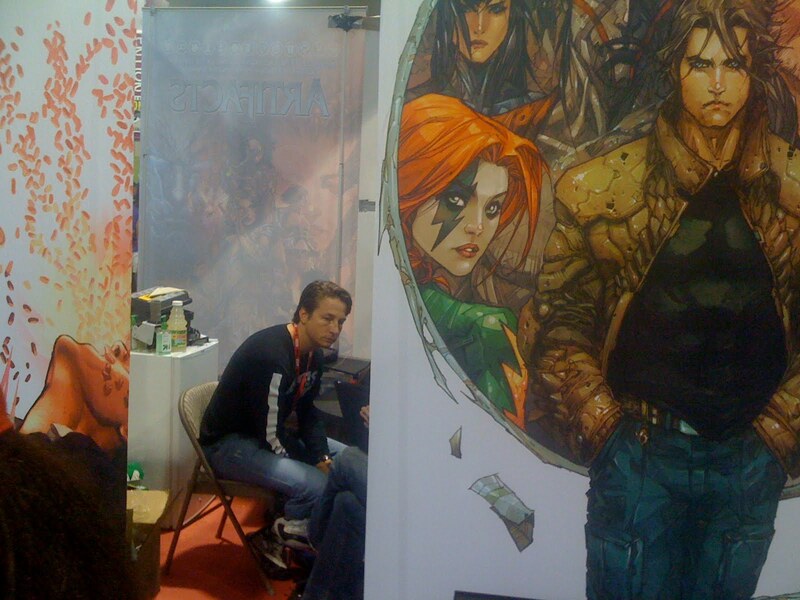 At the top of that list is my good friend Matt Hawkins, president of Top Cow. Back in the day, Matt and I had our own company studio together, Action Toys, which published comics such as Lady Pendragon , Blue , and AlleyCat. We used to spend the entire convention season side by side, hitting every con, big or small, across the country and a few times, around the world! Now we are both so busy we don’t even get to hang out in San Diego unless we are both guests to the same event! And, unfortunately, that didn’t happen this year. Our schedules conflicted at every opportunity. 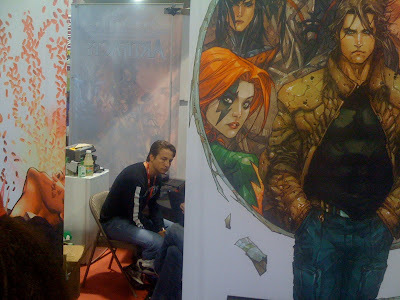 I passed by the Top Cow booth a few times on my way across the hall, in hopes that there might be an open moment to catch up. But Matt was permanently stuck in his meeting box! We did finally get to share a quick lunch (in the meeting box) which almost made me late to the Guild panel! But it was nice to catch up, and I promised I would get down to the TC office for more in-depth conversation. Hopefully we will do more projects together in the future, as we always had a good time in the past. But next year, I’m booking time in advance! Comicon highlight #6: Anything I got to do with Director Sean Becker! I definitely got to spend some quality time with my buddy Sean, who truly is a huge comic book fan! Even if there weren’t thousands of fans that wanted to meet him and talk about the Guild, Sean would be at Comicon just to keep up to date with all the new art and stories. And collect a few new Boba Fett pieces along the way! 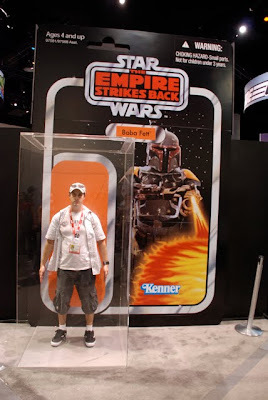 I thought this Star Wars display was the perfect place to catch a photo of him in a 1977 action stance! And hopefully you got your signed TEAM FAWKES poster! If not, they will be available online soon. Comicon fail #6: Not enough swag L. A few days before leaving for San Diego, Felicia text me this photo of the 2,000 buttons that were just delivered to her for give-aways at the Guild Panel. I realized a few days ago that besides the one I got at the panel, I didn’t any others! Then I realized, I hardly had any stuff from the con! I was so busy with business, I hardly got time to check out all the cool stuff at the show. I definitely got to walk the hall, but I was always on a mission to get somewhere, and although I did purchase stuff that jumped out at me, I didn’t really get to comb through all the hidden treasures. I’d love to hear what people think about the size of the show. I mean, is it possible for anyone to see everything? I guess that’s what makes it so exciting. It truly is a treasure hunt! I didn’t leave the con empty handed, though. 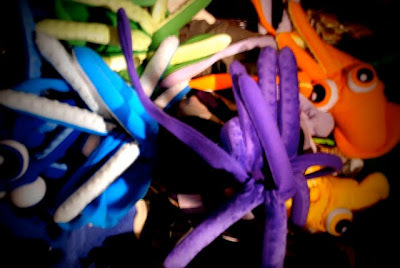 One of my favorite scores is the very rare squid hat, and Kim and Felicia custom ordered one for me in my favorite color, purple. Comicon highlight #7: The Guild and Legend of Neil weren’t the only things I participated in at this years con. I also got to build the Gears of War booth for Microsoft. It was a sort of “photo booth” where viewers got a sneak peek at new in-game footage while their reactions where being filmed for a promotional trailer. 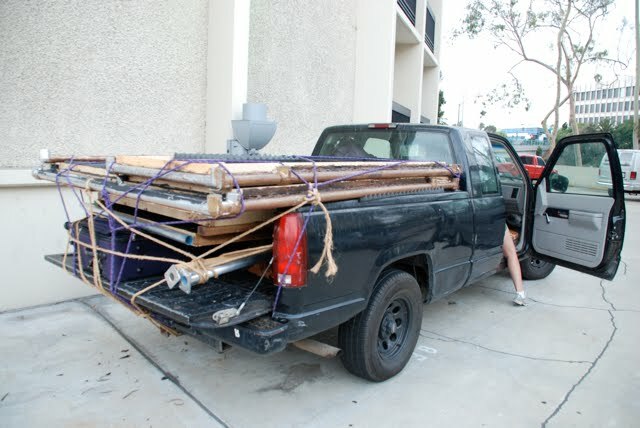 The project was very last minute, so I had to work double time to get it to San Diego on time. For durability and efficiency, I made the entire frame out of 2” aluminum speedrail. The booth section was sheeted in luan, then laminated with several inches of Styrofoam that I carved into and hard coated with resin. The entire thing was painted to look metallic and rusty. The camera section was curtained in, and we made a secondary curtain that was sceniced to look as war torn as the metal. Kirsten Larson, Bryan Fulk, and Nick Carmichael help me jam the whole booth out in less than a week, then we packed it up wet and headed south! Comicon fail #7: The paint was totally dry by the time I arrived at the convention center, but that could be because it took about 5 hours to get there! Even though it was Wednesday, all routes from LA to SD where jammed packed. I was able to get the booth set up really quick, thanks to the speedrail frame, but I still ended up working until 11pm, and missed my dinner with Rod Roddenberry. He totally understood, but it was still awkward being as I was crashing at his house that night! The Roddenberry Dive Team was having their annual Comicon dive at 5am the following morning, so I arrived to a sleeping house and had to tip toe to the guest room. I was totally bummed I didn’t get to hang out with Rod and the gang. And on top of that, I was wearing a Star Wars t-shirt! The morning was much more pleasant, as I awoke to the smell of breakfast and found Kelly Hu ( X-Men , The Scorpion King ) in the kitchen! 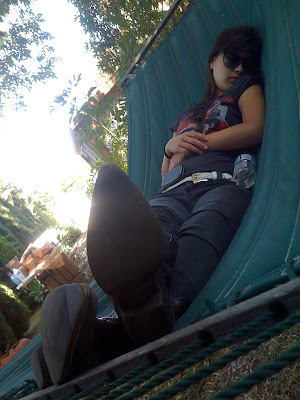 She was staying with the Roddenberry’s for the weekend to host a charity event for the dive team. We hadn’t seen each other for a while, so it was great to catch up. Kind of the perfect comicon morning, if you think about it! Comicon highlight #8: Getting to see so many cosplayers recreating things I designed! It’s always fun to see cosplayers in general, but when someone takes the time to emulate something that came from your imagination, it is really special. I see a lot of that with the Guild fans. I can’t imagine how Felicia feels, with so many amazing Codexs walking around. Codex is like the new Slave Leia! What never ceases to impress me is the level of detail the Guild fans go to. Having built the original Avatar weapons, I know every line and form intimately. So it blows my mind when I see a fan made weapon that is exactly like, or better than, mine! Which is every time I see one. You guys are amazing. But my favorite Guild cosplay this year at Comicon has to be @marissacuevas as B!TCH KAT! Here she is with Codex and Tink! Wondering how B!TCH KAT! fits into the Guild Universe? Well, she is a character I created so there could be a “franchise” type icon in Tink’s room, something Tink is a fan of that can appear in different scenes and be easily identified. Felicia’s original request was “something like Hello Kitty”, but I figured it had to have a little more edge. I tried to take some of the broader strokes of Tink’s personality in the show and build a cartoon character around them, and hence came up with B!TCH KAT! She pops up a few times during season 4. 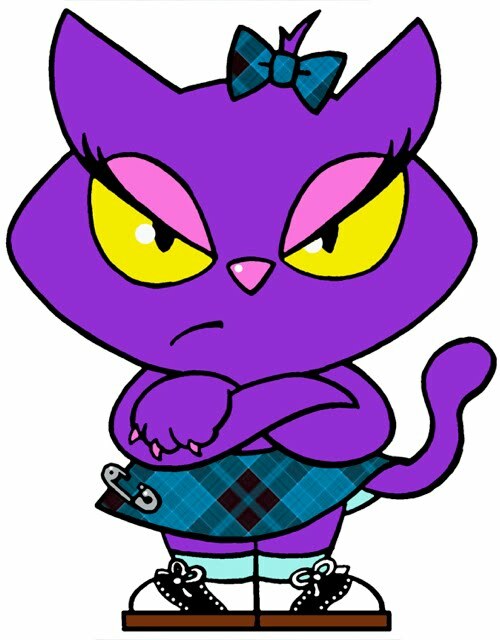 Next time you watch the episodes, keep an eye out for her in Tink’s room! It was great to see Marissa portray the character. She even went to the Guild panel like that. It’s a pretty underground thing, so you could really tell the hard-core Guild fans when they recognized her. And everyone wanted a picture. Even celebrities! 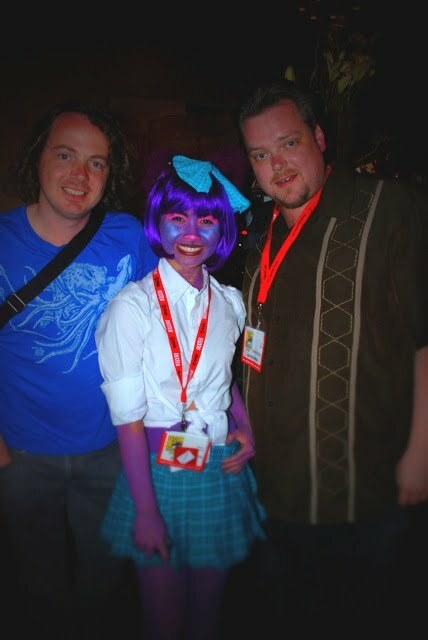 Here she is with Aaron Yonda and Matt Sloan, the creators/stars of B!TCH KAT’s favorite web series, CHAD VADER! Comicon fail 8: Well, I’m really stretching for these fails! I guess that just shows how great the con was this year. But as my last regret during such a fun filled weekend, I wish I had been able to spend more time with my partner Sheri Bryant. 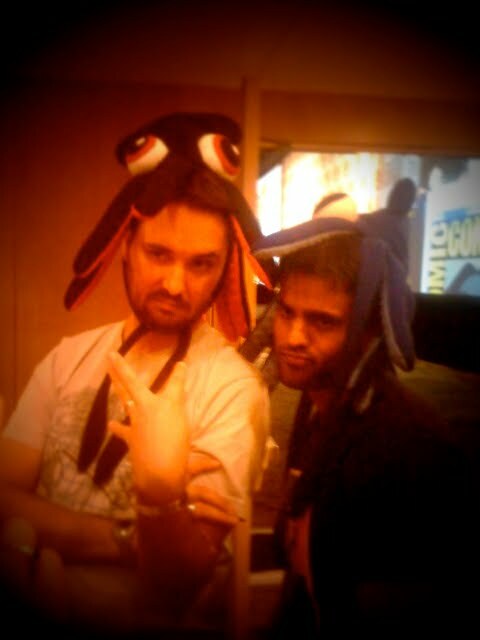 We actually met at comicon 10 years ago, and our common interests lead us to form Dog & Rooster Productions. We usually try to spend at least a day together at the con, scouting the floor for new projects, ideas, and of course, toys! But this year we both got overbooked on separate agendas, and barely got to see each other. Sheri’s main focus this year was to promote our latest feature, "How to Make Love to a Woman" , which just became available on DVD, bluray, and Netflix! Please check it out! So that wraps up my comicon blog. I hope you enjoyed the show if you attended, and if you couldn’t make it, I hope this blog gave you some insight to what was going on there. I’m sad that another year is passed, it was just so much fun. I look forward to next year, and I hope to see you there!